70-year-old messages written by the prisoners of the Ghetto Theresienstadt have been discovered. 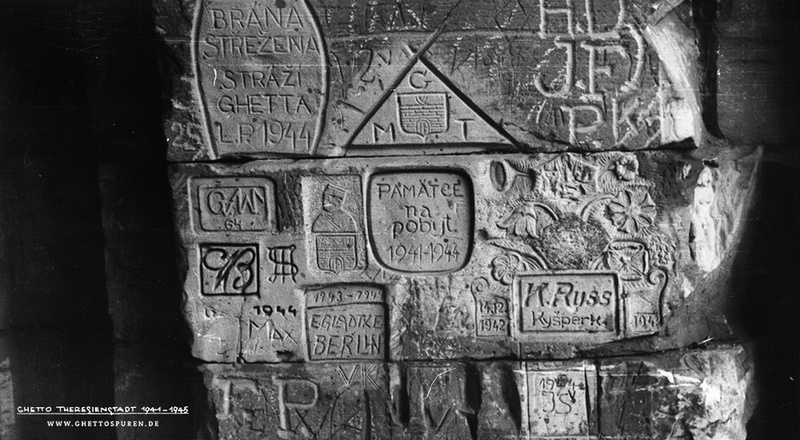 In 1944 the prisoners carved the sandstone of the fortress gate walls with their names, birthplaces, years and pictorial depictions in the hope that these messages would survive for posterity and that their stories would be remembered. Their wish has remained unfulfilled: the carvings were forgotten … until now. 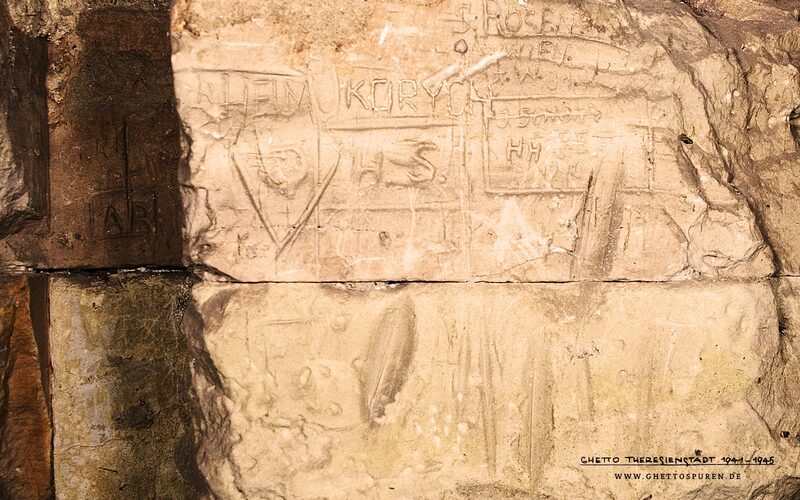 When the fortress gate, Poterne III was opened and made accessible in 2005, after decades of military use, the messages came to light: numerous graffiti were carved into the sandstone, many already difficult to decipher due to wear. The carved years of 1942, 1943, and 1944 could be plainly seen. Upon closer inspection, one could recognize symbols of hope and faith, signatures, transport numbers and dates. The creators of these carvings were primarily prisoners, mostly members of the Ghettowache, the ghetto guard, who were selected from among the prisoners. For almost seventy years, Poterne III kept its secret. We wish to change this and to reconstruct the life stories of the creators. Two interactive maps offer an authentic impression of the place as it appears today. In the public spaces of Terezín there are barely any visible traces of the former ghetto except for the train tracks next to the town gate in the direction of Bohušovice. In that respect, Poterne III holds an absolutely special status, and not only because Poterne III is publicly accessible but also because, in a very small space, there are located numerous carvings left by prisoners. The visitors and inhabitants of Terezín are aware of these carvings but, until now, they did not understand their true meaning due to lack of any context. Until now, these carvings were neither inventoried nor documented. Further, Poterne III lacks any type of posted information or any other type of information access about the carved inscriptions. Upon return to continue our work, we realized that the flood impacted the fortress structures. We noticed the water-wear on the sandstone surfaces that contained names and pictorial depictions. Their contours were almost obliterated. Nevertheless, even in the case of certain heavily damaged carvings, we managed to ascertain the shape of the original inscriptions. Roland Wildberg focused on the photo documentation, and I pursued research in the archives and databanks. A very useful tool for my work proved to be the Terezín Memorial databank by means of which I was able to reconstruct the names of many creators. Information was compiled piece-by-piece like the little stones of a mosaic to achieve a whole. It was not a simple task, as oftentimes I had to work with only fragments of names and specific years. For example, during searches in the database, thanks to the “placeholder” program feature, I was able to reconstruct the names of prisoners from name fragments. In that way I recovered the name of Ernst Gladtke. Gladtke was born in Germany and was imprisoned in Terezin until 1944. The letters “E” and a letter group “TKE” as well as the year dates 1943 and 1944 were the only concrete fragments I had to work with. Further research about Ernst Gladtke eventually led me to the discovery of two photos in the Terezin Memorial archive taken by Jiří Lauscher shortly after the liberation of Terezín in 1945. Lauscher was also a former prisoner in the ghetto. Right after the war’s end he recognized the outstanding historical value of these carvings. Both photos depict two exposed sections of Poterne III. 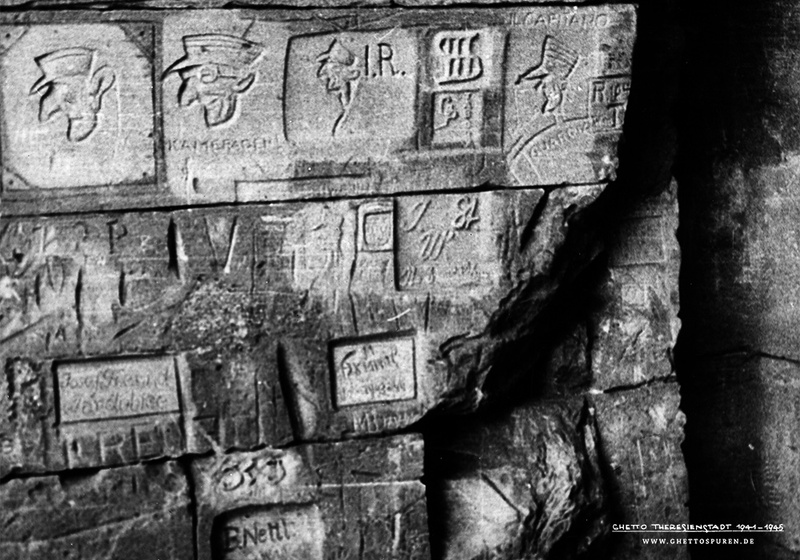 The photos allow us to decipher some of the original text carved by the prisoners. The professional documentation of these historical messages became our most important goal. It is now accessible to all visitors of these webpages. Despite that, there is much work ahead of us. Outside of missing sources – for example, we have not yet found Poterne III survivor accounts – we still lack information about the use of the Poterne during the years 1941-1945. Who, other than the Ghettowache, had access to this fortress gate and why? Many questions remain unanswered and they will occupy us in the future. WHO WERE THE CREATORS OF THE CARVINGS? At the time when these men carved their inscriptions, the youngest was 16 and the oldest was 66 years old. With the exception of the three youngest ones, all were married, had children and belonged to the then middle class in their respective homelands until their societies expelled them. The early assumption that the carvings were created by much younger persons was found to be false. On average, the men remained in the ghetto for two years until transports to Auschwitz between December 1943 and October 1944. Four of the men escaped mass murder after being assigned to work-details in other camps. However, in early 1945 they had to enter another hell, the death marches. The only exception was Benno Nettl, who was arrested by the Gestapo and taken to the Small Fortress where he was murdered. The 2013 flood did not impact the town of Terezín itself. However, the fortress constructions that surround the town were impacted and not all repairs have been yet made. 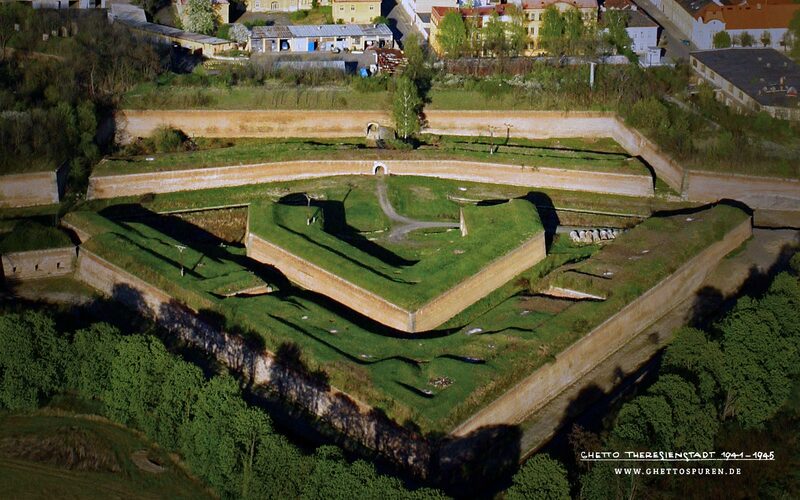 The aerial photograph shows the northwestern section with Ravelin XVIII, a fortress defense wall system. 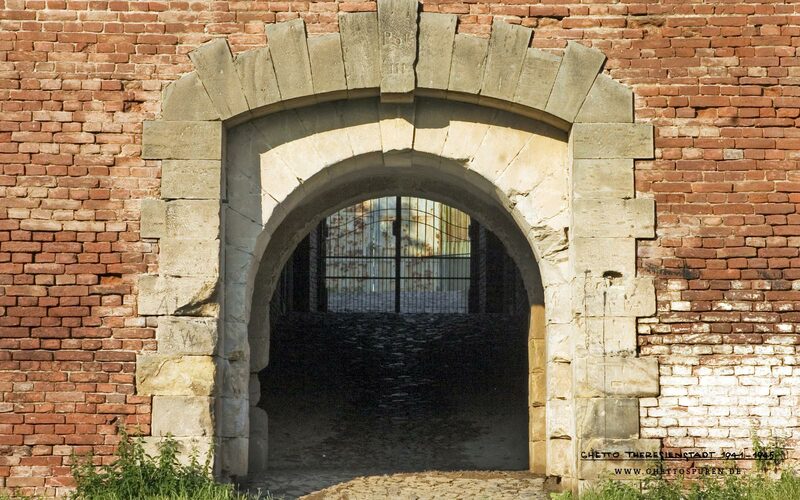 This part of the fortress has been recently developed for tourism and also serves as a pedestrian zone for Terezin’s residents. Visible in the photo where grasses stand over three feet tall, there used to be kitchen gardens where prisoners were forced to grow fruits and vegetables for the SS. It is possible to enter this part of the fortress through a historical gate, the Poterne III. The builders of this fortress envisioned this gate as a place from which to launch attacks against enemies. Close to the outer gate toward the moat on both sides of the passageway, one cannot but notice the countless graffiti. Erosion and vandalism have already rendered unrecognizable a large number of these silent witnesses from the past. Many of the inscriptions date not only from the ghetto period but also from the 19thand early 20th centuries. The middle section of the south wall is imbued with a special meaning: a collective remembrance site. The members of the ghetto guard created it shortly before being deported to Auschwitz. On the north wall, there are various carvings that provide evidence that the Ghettowache guarded this fortress gate. These are carvings of self-assured and creative men, who, in an individual and very personal way, created a memorial to their forced stay in the ghetto. In today’s Terezín there are many traces from the ghetto times, yet nowhere else did the prisoners leave anything like this. Three men we know of were members of the Ghettowache, the ghetto guard: Samuel Rosen (north wall) and Benno Nettl (south wall). The two men carved their Ghettowache number into the stone. Ernst Gladtke (south wall) did not record his number. However, his wife mentions his Ghettowache membership in her memoirs. In the light of many references to the Ghettowache, we may presume that other names are of members of the ghetto guard. Wilhelm Waltuch, Josef Freund, Felix Alterthum and Karel Russ would fit into the age group. From July 1943, the age limit of ghetto guardsmen had to be 45 and up.